An important aspect of a fiber optic communication is that of extension of the fiber optic cables such that the losses brought about by joining two different cables is kept to a minimum. Joining lengths of optical fiber often proves to be more complex than joining electrical wire or cable and involves careful cleaving of the fibers, perfect alignment of the fiber cores, and the splicing of these aligned fiber cores. For applications that demand a permanent connection a mechanical splice which holds the ends of the fibers together mechanically could be used or a fusion splice that uses heat to fuse the ends of the fibers together could be used. Temporary or semi-permanent connections are made by means of specialized optical fiber connectors. The field of applied science and engineering concerned with the design and application of optical fibers is known as fiber optics. The term was coined by Narinder Singh Kapany who is widely acknowledged as the father of fiber-optics. Daniel Colladon first described this “light fountain” or “light pipe” in an 1842 article titled On the reflections of a ray of light inside a parabolic liquid stream. This particular illustration comes from a later article by Colladon, in 1884. Unpigmented human hairs have also been shown to act as an optical fiber. 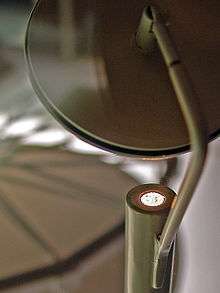 Practical applications, such as close internal illumination during dentistry, appeared early in the twentieth century. Image transmission through tubes was demonstrated independently by the radio experimenter Clarence Hansell and the television pioneer John Logie Baird in the 1920s. The principle was first used for internal medical examinations by Heinrich Lamm in the following decade. Modern optical fibers, where the glass fiber is coated with a transparent cladding to offer a more suitable refractive index, appeared later in the decade. Development then focused on fiber bundles for image transmission. Harold Hopkins and Narinder Singh Kapany at Imperial College in London achieved low-loss light transmission through a 75 cm long bundle which combined several thousand fibers. Their article titled "A flexible fibrescope, using static scanning" was published in the journal Nature in 1954. The first fiber optic semi-flexible gastroscope was patented by Basil Hirschowitz, C. Wilbur Peters, and Lawrence E. Curtiss, researchers at the University of Michigan, in 1956. In the process of developing the gastroscope, Curtiss produced the first glass-clad fibers; previous optical fibers had relied on air or impractical oils and waxes as the low-index cladding material. A variety of other image transmission applications soon followed. In 1880 Alexander Graham Bell and Sumner Tainter invented the Photophone at the Volta Laboratory in Washington, D.C., to transmit voice signals over an optical beam. It was an advanced form of telecommunications, but subject to atmospheric interferences and impractical until the secure transport of light that would be offered by fiber-optical systems. In the late 19th and early 20th centuries, light was guided through bent glass rods to illuminate body cavities. Jun-ichi Nishizawa, a Japanese scientist at Tohoku University, also proposed the use of optical fibers for communications in 1963, as stated in his book published in 2004 in India. Nishizawa invented other technologies that contributed to the development of optical fiber communications, such as the graded-index optical fiber as a channel for transmitting light from semiconductor lasers. The first working fiber-optical data transmission system was demonstrated by German physicist Manfred Börner at Telefunken Research Labs in Ulm in 1965, which was followed by the first patent application for this technology in 1966. NASA used fiber optics in the television cameras that were sent to the moon. At the time, the use in the cameras was classified confidential, and employees handling the cameras had to be supervised by someone with an appropriate security clearance. An Indian physicist working at the ordnance factory in Dehradun in the 1950s was experimenting with using right-angled prisms to bend light. That physicist, Narinder Singh Kapany, subsequently went on to first demonstrate successfully that light can be transmitted through bent glass fibres during his doctoral work at the Imperial College of Science in London in the early fifties, and published the findings in a paper in Nature in 1954. Since then, Kapany developed applications of fibre optics for endoscopy during the fifties and later coined the term 'Fibre Optics' in an article in Scientific American in 1960. For his body of work on the subject, he is known as the father of fiber-optics. Charles K. Kao and George A. Hockham of the British company Standard Telephones and Cables (STC) were the first to promote the idea that the attenuation in optical fibers could be reduced below 20 decibels per kilometer (dB/km), making fibers a practical communication medium. They proposed that the attenuation in fibers available at the time was caused by impurities that could be removed, rather than by fundamental physical effects such as scattering. They correctly and systematically theorized the light-loss properties for optical fiber, and pointed out the right material to use for such fibers — silica glass with high purity. This discovery earned Kao the Nobel Prize in Physics in 2009. Robust modern optical fiber uses glass for both core and sheath, and is therefore less prone to aging. It was invented by Gerhard Bernsee of Schott Glass in Germany in 1973. The Italian research center CSELT worked with Corning to develop practical optical fiber cables, resulting in the first metropolitan fiber optic cable being deployed in Torino in 1977. CSELT also developed an early technique for splicing optical fibers, called Springroove. 2010 - Bell Labs in Villarceaux, France transferred 100 petabits per second. Optical fiber can be used as a medium for telecommunication and computer networking because it is flexible and can be bundled as cables. It is especially advantageous for long-distance communications, because light propagates through the fiber with little attenuation compared to electrical cables. This allows long distances to be spanned with few repeaters. Each fiber can carry many independent channels, each using a different wavelength of light (wavelength-division multiplexing (WDM)). The net data rate (data rate without overhead bytes) per fiber is the per-channel data rate reduced by the FEC overhead, multiplied by the number of channels (usually up to eighty in commercial dense WDM systems as of 2008). As of 2011 the record for bandwidth on a single core was 101 Tbit/s (370 channels at 273 Gbit/s each). The record for a multi-core fiber as of January 2013 was 1.05 petabits per second. In 2009, Bell Labs broke the 100 (petabit per second)×kilometer barrier (15.5 Tbit/s over a single 7,000 km fiber). 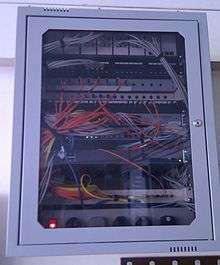 For short distance application, such as a network in an office building (see FTTO), fiber-optic cabling can save space in cable ducts. This is because a single fiber can carry much more data than electrical cables such as standard category 5 Ethernet cabling, which typically runs at 100 Mbit/s or 1 Gbit/s speeds. Fiber is also immune to electrical interference; there is no cross-talk between signals in different cables, and no pickup of environmental noise. Non-armored fiber cables do not conduct electricity, which makes fiber a good solution for protecting communications equipment in high voltage environments, such as power generation facilities, or metal communication structures prone to lightning strikes. They can also be used in environments where explosive fumes are present, without danger of ignition. Wiretapping (in this case, fiber tapping) is more difficult compared to electrical connections, and there are concentric dual-core fibers that are said to be tap-proof. A single optical fiber can carry over 3,000,000 full-duplex voice calls or 90,000 TV channels. Light transmission through optical fibers is unaffected by other electromagnetic radiation nearby. The optical fiber is electrically non-conductive, so it does not act as an antenna to pick up electromagnetic signals. Information traveling inside the optical fiber is immune to electromagnetic interference, even electromagnetic pulses generated by nuclear devices. Attenuation loss can be as low as 0.2 dB/km in optical fiber cables, allowing transmission over long distances without the need for repeaters. Optical fibers do not conduct electricity, preventing problems with ground loops and conduction of lightning. Optical fibers can be strung on poles alongside high voltage power cables. Conventional cable systems use large amounts of copper. Global copper prices experienced a boom in the 2000s, and copper has been a target of metal theft. Copper can be tapped with very little chance of detection. Optical fibers can be used as sensors to measure strain, temperature, pressure and other quantities by modifying a fiber so that the property to measure modulates the intensity, phase, polarization, wavelength, or transit time of light in the fiber. Sensors that vary the intensity of light are the simplest, since only a simple source and detector are required. A particularly useful feature of such fiber optic sensors is that they can, if required, provide distributed sensing over distances of up to one meter. In contrast, highly localized measurements can be provided by integrating miniaturized sensing elements with the tip of the fiber. These can be implemented by various micro- and nanofabrication technologies, such that they do not exceed the microscopic boundary of the fiber tip, allowing such applications as insertion into blood vessels via hypodermic needle. Extrinsic fiber optic sensors use an optical fiber cable, normally a multi-mode one, to transmit modulated light from either a non-fiber optical sensor—or an electronic sensor connected to an optical transmitter. A major benefit of extrinsic sensors is their ability to reach otherwise inaccessible places. An example is the measurement of temperature inside aircraft jet engines by using a fiber to transmit radiation into a radiation pyrometer outside the engine. Extrinsic sensors can be used in the same way to measure the internal temperature of electrical transformers, where the extreme electromagnetic fields present make other measurement techniques impossible. Extrinsic sensors measure vibration, rotation, displacement, velocity, acceleration, torque, and twisting. A solid state version of the gyroscope, using the interference of light, has been developed. The fiber optic gyroscope (FOG) has no moving parts, and exploits the Sagnac effect to detect mechanical rotation. 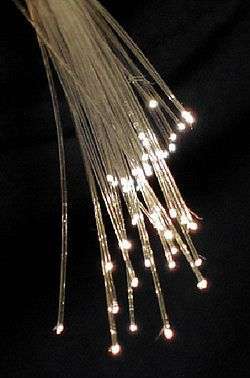 Optical fibers have a wide number of applications. They are used as light guides in medical and other applications where bright light needs to be shone on a target without a clear line-of-sight path. In some buildings, optical fibers route sunlight from the roof to other parts of the building (see nonimaging optics). Optical fiber lamps are used for illumination in decorative applications, including signs, art, toys and artificial Christmas trees. Swarovski boutiques use optical fibers to illuminate their crystal showcases from many different angles while only employing one light source. Optical fiber is an intrinsic part of the light-transmitting concrete building product, LiTraCon. Use of optical fiber in a decorative lamp or nightlight. An optical fiber doped with certain rare earth elements such as erbium can be used as the gain medium of a laser or optical amplifier. Rare-earth-doped optical fibers can be used to provide signal amplification by splicing a short section of doped fiber into a regular (undoped) optical fiber line. The doped fiber is optically pumped with a second laser wavelength that is coupled into the line in addition to the signal wave. Both wavelengths of light are transmitted through the doped fiber, which transfers energy from the second pump wavelength to the signal wave. 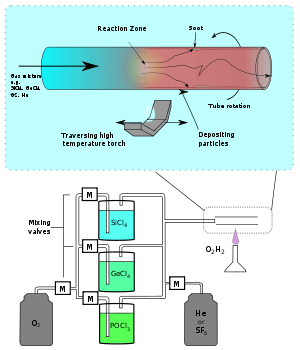 The process that causes the amplification is stimulated emission. Fiber optic sights for handguns, rifles, and shotguns use pieces of optical fiber to improve visibility of markings on the sight. The index of refraction (or refractive index) is a way of measuring the speed of light in a material. Light travels fastest in a vacuum, such as in outer space. The speed of light in a vacuum is about 300,000 kilometers (186,000 miles) per second. The refractive index of a medium is calculated by dividing the speed of light in a vacuum by the speed of light in that medium. The refractive index of a vacuum is therefore 1, by definition. A typical singlemode fiber used for telecommunications has a cladding made of pure silica, with an index of 1.444 at 1,500 nm, and a core of doped silica with an index around 1.4475. The larger the index of refraction, the slower light travels in that medium. From this information, a simple rule of thumb is that a signal using optical fiber for communication will travel at around 200,000 kilometers per second. To put it another way, the signal will take 5 milliseconds to travel 1,000 kilometers in fiber. Thus a phone call carried by fiber between Sydney and New York, a 16,000-kilometer distance, means that there is a minimum delay of 80 milliseconds (about of a second) between when one caller speaks and the other hears. (The fiber in this case will probably travel a longer route, and there will be additional delays due to communication equipment switching and the process of encoding and decoding the voice onto the fiber). 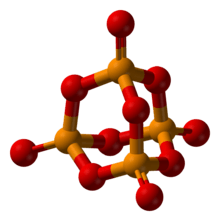 The P4O10 cagelike structure—the basic building block for phosphate glass. Phosphate glasses can be advantageous over silica glasses for optical fibers with a high concentration of doping rare earth ions. A mix of fluoride glass and phosphate glass is fluorophosphate glass. Today’s glass optical fiber draw processes employ a dual-layer coating approach. An inner primary coating is designed to act as a shock absorber to minimize attenuation caused by microbending. An outer secondary coating protects the primary coating against mechanical damage and acts as a barrier to lateral forces. Sometimes a metallic armor layer is added to provide extra protection. Three key characteristics of fiber optic waveguides can be affected by environmental conditions: strength, attenuation and resistance to losses caused by microbending. External fiber optic coatings protect glass optical fiber from environmental conditions that can affect the fiber’s performance and long-term durability. On the inside, coatings ensure the reliability of the signal being carried and help minimize attenuation due to microbending. Modern cables come in a wide variety of sheathings and armor, designed for applications such as direct burial in trenches, high voltage isolation, dual use as power lines, installation in conduit, lashing to aerial telephone poles, submarine installation, and insertion in paved streets. Multi-fiber cable usually uses colored coatings and/or buffers to identify each strand. The cost of small fiber-count pole-mounted cables has greatly decreased due to the high demand for fiber to the home (FTTH) installations in Japan and South Korea. ST connectors on multi-mode fiber. Optical fibers are connected to terminal equipment by optical fiber connectors. These connectors are usually of a standard type such as FC, SC, ST, LC, MTRJ, or SMA. Optical fibers may be connected to each other by connectors or by splicing, that is, joining two fibers together to form a continuous optical waveguide. The generally accepted splicing method is arc fusion splicing, which melts the fiber ends together with an electric arc. For quicker fastening jobs, a “mechanical splice” is used. In the 1990s, terminating fiber optic cables was labor-intensive. The number of parts per connector, polishing of the fibers, and the need to oven-bake the epoxy in each connector made terminating fiber optic cables difficult. Today, many connectors types are on the market that offer easier, less labor-intensive ways of terminating cables. 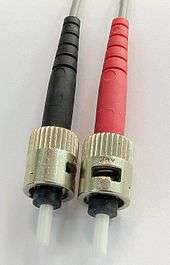 Some of the most popular connectors are pre-polished at the factory, and include a gel inside the connector. Those two steps help save money on labor, especially on large projects. 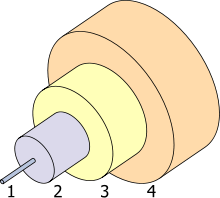 A cleave is made at a required length, to get as close to the polished piece already inside the connector. The gel surrounds the point where the two pieces meet inside the connector for very little light loss. It is often necessary to align an optical fiber with another optical fiber, or with an optoelectronic device such as a light-emitting diode, a laser diode, or a modulator. This can involve either carefully aligning the fiber and placing it in contact with the device, or can use a lens to allow coupling over an air gap. 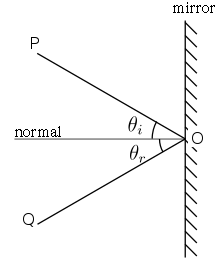 Typically the size of the fiber mode is much larger than the size of the mode in a laser diode or a silicon optical chip. In this case a tapered or lensed fiber is used to match the fiber mode field distribution to that of the other element. The lens on the end of the fiber can be formed using polishing, laser cutting or fusion splicing. ↑ "Optical Fiber". www.thefoa.org. The Fiber Optic Association. Retrieved 17 April 2015. ↑ Senior, John M.; Jamro, M. Yousif (2009). Optical fiber communications: principles and practice. Pearson Education. Retrieved 17 April 2015. ↑ "Birth of Fiberscopes". www.olympus-global.com. Olympus Corporation. Retrieved 17 April 2015. ↑ Lee, Byoungho (2003). "Review of the present status of optical fiber sensors.". 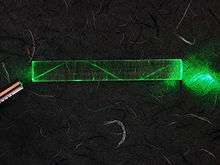 Optical Fiber Technology. 9 (2): 57–79. doi:10.1016/s1068-5200(02)00527-8. 1 2 Bates, Regis J (2001). Optical Switching and Networking Handbook. New York: McGraw-Hill. p. 10. ISBN 0-07-137356-X. ↑ Tyndall, John (1870). "Total Reflexion". Notes about Light. ↑ Tyndall, John (1873). "Six Lectures on Light". ↑ Wells, J. (1989). "Hair light guide". Nature. 338 (6210): 23. Bibcode:1989Natur.338...23W. doi:10.1038/338023b0. PMID 2918918. ↑ Hopkins, H. H. & Kapany, N. S. (1954). "A flexible fibrescope, using static scanning". Nature. 173 (4392): 39–41. Bibcode:1954Natur.173...39H. doi:10.1038/173039b0. ↑ Jones, Newell. First 'Radio' Built by San Diego Resident Partner of Inventor of Telephone: Keeps Notebook of Experiences With Bell, San Diego Evening Tribune, July 31, 1937. ↑ DE patent 1254513, Börner, Manfred, "Mehrstufiges Übertragungssystem für Pulscodemodulation dargestellte Nachrichten. ", issued 1967-11-16, assigned to Telefunken Patentverwertungsgesellschaft m.b.H. ↑ US patent 3845293, Börner, Manfred, "Electro-optical transmission system utilizing lasers"
↑ Hecht, Jeff (1999). City of Light, The Story of Fiber Optics. New York: Oxford University Press. p. 114. ISBN 0-19-510818-3. ↑ "Press Release — Nobel Prize in Physics 2009". The Nobel Foundation. Retrieved 2009-10-07. ↑ Hecht, Jeff (1999). City of Light, The Story of Fiber Optics. New York: Oxford University Press. p. 271. ISBN 0-19-510818-3. ↑ "1971–1985 Continuing the Tradition". GE Innovation Timeline. General Electric Company. Retrieved 2012-09-28. 1 2 "About the Author – Thomas Mensah". The Right Stuff Comes in Black. Retrieved 29 March 2015. ↑ Catania, B., et al. "First Italian Experiment with a Buried Optical Cable." Proc. of 2nd European conference on Optical Fiber Communication. 1976. ↑ Russell, Philip (2003). "Photonic Crystal Fibers". Science. 299 (5605): 358–62. Bibcode:2003Sci...299..358R. doi:10.1126/science.1079280. PMID 12532007. ↑ "The History of Crystal fiber A/S". Crystal Fiber A/S. Retrieved 2008-10-22. ↑ 14 Tbps over a Single Optical Fiber: Successful Demonstration of World's Largest Capacity – 145 digital high-definition movies transmitted in one second. NTT Press Release. September 29, 2006. ↑ Alfiad, M. S.; et al. (2008). "111 Gb/s POLMUX-RZ-DQPSK Transmission over 1140 km of SSMF with 10.7 Gb/s NRZ-OOK Neighbours" (PDF). Proceedings ECOC 2008. pp. Mo.4.E.2. ↑ Yao, S. (2003) "Polarization in Fiber Systems: Squeezing Out More Bandwidth" Archived July 11, 2011, at the Wayback Machine., The Photonics Handbook, Laurin Publishing, p. 1. ↑ Ciena, JANET Delivers Europe’s First 40 Gbps Wavelength Service 07/09/2007. Retrieved 29 Oct 2009. ↑ Bozinovic, N.; Yue, Y.; Ren, Y.; Tur, M.; Kristensen, P.; Huang, H.; Willner, A. E.; Ramachandran, S. (2013). "Terabit-Scale Orbital Angular Momentum Mode Division Multiplexing in Fibers". Science. 340 (6140): 1545–1548. doi:10.1126/science.1237861. PMID 23812709. ↑ Hecht, Jeff (2011-04-29). "Ultrafast fibre optics set new speed record". New Scientist. 210 (2809): 24. Bibcode:2011NewSc.210R..24H. doi:10.1016/S0262-4079(11)60912-3. Retrieved 2012-02-26. ↑ Siemen's claim to a fiber optic line that cannot be tapped. Retrieved 18 Dec 2009. ↑ Kostovski, G; Stoddart, P. R.; Mitchell, A (2014). "The optical fiber tip: An inherently light-coupled microscopic platform for micro- and nanotechnologies". Advanced Materials. 26 (23): 3798–820. doi:10.1002/adma.201304605. PMID 24599822. ↑ Bănică, Florinel-Gabriel (2012). Chemical Sensors and Biosensors: Fundamentals and Applications. Chichester: John Wiley and Sons. Ch. 18–20. ISBN 978-0-470-71066-1. ↑ Al Mosheky, Zaid; Melling, Peter J.; Thomson, Mary A. (June 2001). "In situ real-time monitoring of a fermentation reaction using a fiber-optic FT-IR probe" (PDF). Spectroscopy. 16 (6): 15. ↑ Melling, Peter; Thomson, Mary (October 2002). "Reaction monitoring in small reactors and tight spaces" (PDF). American Laboratory News. ↑ Govind, Agrawal. Nonlinear Fiber Optics, Fifth Edition. ISBN 0123970237. 1 2 Paschotta, Rüdiger. "Fibers". Encyclopedia of Laser Physics and Technology. RP Photonics. Retrieved Feb 22, 2015. ↑ "Corning SMF-28 ULL optical fiber". Retrieved April 9, 2014. ↑ Williams, E. A. (ed.) (2007). National Association of Broadcasters Engineering Handbook (Tenth Edition). Taylor & Francis. pp. 1667–1685 (Chapter 6.10 – Fiber–Optic Transmission Systems, Jim Jachetta). ISBN 978-0-240-80751-5. ↑ Archibald, P.S. & Bennett, H.E. (1978). "Scattering from infrared missile domes". Opt. Engr. 17 (6): 647. doi:10.1117/12.7972298. ↑ Smith, R. G. (1972). "Optical Power Handling Capacity of Low Loss Optical Fibers as Determined by Stimulated Raman and Brillouin Scattering". Applied Optics. 11 (11): 2489–94. Bibcode:1972ApOpt..11.2489S. doi:10.1364/AO.11.002489. PMID 20119362. ↑ Paschotta, Rüdiger. "Brillouin Scattering". Encyclopedia of Laser Physics and Technology. RP Photonics. ↑ Skuja, L.; Hirano, M.; Hosono, H.; Kajihara, K. (2005). "Defects in oxide glasses". Physica status solidi (c). 2: 15–24. doi:10.1002/pssc.200460102. ↑ Glaesemann, G. S. (1999). "Advancements in Mechanical Strength and Reliability of Optical Fibers". Proc. SPIE. CR73: 1. Bibcode:1999SPIE.CR73....3G. 1 2 Kurkjian, Charles R.; Simpkins, Peter G.; Inniss, Daryl (1993). "Strength, Degradation, and Coating of Silica Lightguides". Journal of the American Ceramic Society. 76 (5): 1106–1112. doi:10.1111/j.1151-2916.1993.tb03727.x. ↑ Kurkjian, C (1988). "Mechanical stability of oxide glasses". Journal of Non-Crystalline Solids. 102: 71–81. Bibcode:1988JNCS..102...71K. doi:10.1016/0022-3093(88)90114-7. ↑ Kurkjian, C.R. ; Krause, J.T. ; Matthewson, M.J. (1989). "Strength and fatigue of silica optical fibers". Journal of Lightwave Technology. 7 (9): 1360–1370. Bibcode:1989JLwT....7.1360K. doi:10.1109/50.50715. ↑ Kurkjian, Charles R.; Gebizlioglu, Osman S.; Camlibel, Irfan (1999). Matthewson, M. John, ed. "Strength variations in silica fibers". Proceedings of SPIE. Optical Fiber Reliability and Testing. 3848: 77. doi:10.1117/12.372757. ↑ Skontorp, Arne (2000). Gobin, Pierre F; Friend, Clifford M, eds. "Nonlinear mechanical properties of silica-based optical fibers". Proceedings of SPIE. Fifth European Conference on Smart Structures and Materials. 4073: 278. doi:10.1117/12.396408. ↑ Proctor, B. A.; Whitney, I.; Johnson, J. W. (1967). "The Strength of Fused Silica". Proceedings of the Royal Society A. 297 (1451): 534–557. Bibcode:1967RSPSA.297..534P. doi:10.1098/rspa.1967.0085. ↑ Bartenev, G (1968). "The structure and strength of glass fibers". Journal of Non-Crystalline Solids. 1: 69–90. Bibcode:1968JNCS....1...69B. doi:10.1016/0022-3093(68)90007-0. ↑ Tran, D.; et al. (1984). "Heavy metal fluoride glasses and fibers: A review". J. Lightwave Technology. 2 (5): 566–586. Bibcode:1984JLwT....2..566T. doi:10.1109/JLT.1984.1073661. ↑ Nee, Soe-Mie F.; Johnson, Linda F.; Moran, Mark B.; Pentony, Joni M.; Daigneault, Steven M.; Tran, Danh C.; Billman, Kenneth W.; Siahatgar, Sadegh (2000). Marker Iii, Alexander J; Arthurs, Eugene G, eds. "Optical and surface properties of oxyfluoride glass". Proceedings of SPIE. Inorganic Optical Materials II. 4102: 122. doi:10.1117/12.405276. ↑ Karabulut, M; Melnik, E; Stefan, R; Marasinghe, G.K; Ray, C.S; Kurkjian, C.R; Day, D.E (2001). "Mechanical and structural properties of phosphate glasses". Journal of Non-Crystalline Solids. 288: 8–17. Bibcode:2001JNCS..288....8K. doi:10.1016/S0022-3093(01)00615-9. ↑ Kurkjian, C (2000). "Mechanical properties of phosphate glasses". Journal of Non-Crystalline Solids. 263–264: 207–212. Bibcode:2000JNCS..263..207K. doi:10.1016/S0022-3093(99)00637-7. ↑ Gowar, John (1993). Optical communication systems (2d ed.). Hempstead, UK: Prentice-Hall. p. 209. ISBN 0-13-638727-6. ↑ Kouznetsov, D.; Moloney, J.V. (2003). "Highly efficient, high-gain, short-length, and power-scalable incoherent diode slab-pumped fiber amplifier/laser". IEEE Journal of Quantum Electronics. 39 (11): 1452–1461. Bibcode:2003IJQE...39.1452K. doi:10.1109/JQE.2003.818311. ↑ "Light collection and propagation". National Instruments' Developer Zone. National Instruments Corporation. Archived from the original on January 25, 2007. Retrieved 2007-03-19. ↑ Hecht, Jeff (2002). Understanding Fiber Optics (4th ed.). Prentice Hall. ISBN 0-13-027828-9. ↑ "Screening report for Alaska rural energy plan" (PDF). Alaska Division of Community and Regional Affairs. Archived from the original (PDF) on May 8, 2006. Retrieved April 11, 2006. ↑ "Corning announces breakthrough optical fiber technology" (Press release). Corning Incorporated. 2007-07-23. Archived from the original on June 13, 2011. Retrieved 2013-09-09. ↑ Olzak, Tom (2007-05-03). "Protect your network against fiber hacks". Techrepublic. CNET. Archived from the original on 2010-02-17. Retrieved 2007-12-10. ↑ "Laser Lensing". OpTek Systems Inc.
↑ Atkins, R. M.; Simpkins, P. G.; Yablon, A. D. (2003). "Track of a fiber fuse: a Rayleigh instability in optical waveguides". Optics Letters. 28 (12): 974–976. Bibcode:2003OptL...28..974A. doi:10.1364/OL.28.000974. PMID 12836750. ↑ Hitz, Breck (August 2003). "Origin of 'fiber fuse' is revealed". Photonics Spectra. Retrieved 2011-01-23. ↑ Seo, Koji; et al. (October 2003). "Evaluation of high-power endurance in optical fiber links" (PDF). Furukawa Review (24): 17–22. ISSN 1348-1797. Retrieved 2008-07-05. ↑ G. P. Agrawal, Fiber Optic Communication Systems, Wiley-Interscience, 1997. Agrawal, Govind (2010). Fiber-Optic Communication Systems (4 ed.). Wiley. doi:10.1002/9780470918524. ISBN 9780470505113. Gambling, W. A. (2000). "The Rise and Rise of Optical Fibers". IEEE Journal on Selected Topics in Quantum Electronics. 6 (6): 1084–1093. doi:10.1109/2944.902157.